Enveloped, spherical to pleomorphic, 150-200 nm in diameter, T=16 icoseadral symmetry. Capsid consists of 162 capsomers. Glycoproteins complexes are embeded in the lipid envelope. Virus attaches to host receptors through gB, gC, gD and gH . 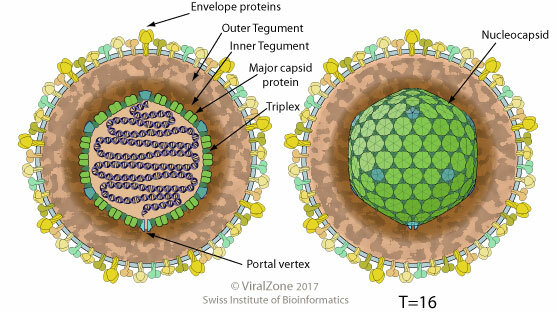 Assembly of the virus and budding through the inner lamella of the nuclear membrane which has been modified by the insertion of herpes glycoproteins, throughout the Golgi and final release at the plasma membrane.